Hi there, my darlings! Now, most of you know that I don't really post on the weekends but I'm making an exception for this special announcement! 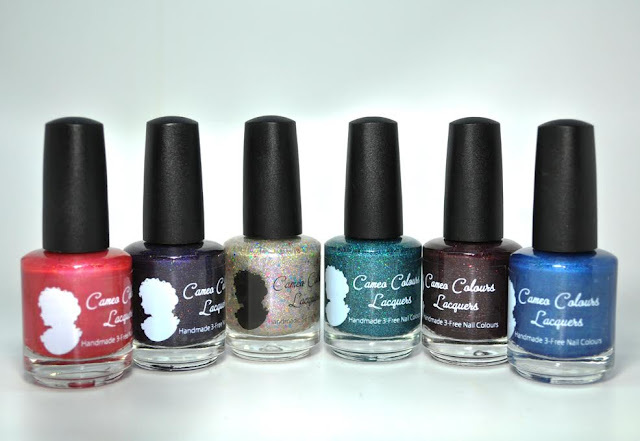 My girl, Cameo of Cameo Colours Lacquers is celebrating 3 fabulous years of being in business--yup, CCL turns 3 TODAY! As some of you who have been following me for awhile know, I've been working with Cameo since almost the very beginning--when she was a newbie maker and I was a fledgling blogger. Over the course of these 2 years, we've not only established a great working relationship but have become good friends--ah, the power of the internet! So, today I'm just as excited to be celebrating this milestone with her as she is! For this giveaway, Cameo asked me to pick a few of my faves from her store...and let me tell you, the list was a mile-long! And Cameo being Cameo, she included just about ALL of them for this prize pack! So. ONE lucky winner will walk away with full-size bottles of Babi's Bollywood Bling, You're Sapphired, Life's Greatest Lesson, Riddled With Passion, and Just His Type plus a bottle of the custom Third Time's A Charm that she created just for this giveaway. Yup, SIX bottles! Lucky duck! Take a peek at them all lined up and enter through the Rafflecopter for your chance to win!!! You can ALSO enter to win another prize pack from Becky of Naked Without Polish OR enter to win one of the exclusive customs from Cameo hereself HERE. Of course BABIS BOLLYWOOD BLING! 😉 with JUST HIS TYPE very close second! !!! My favorite is Riddled with Passion. Thank you! You're Sapphired because I love blues but all of them look great!! Not a boring one in the bunch!! That red one, Babi's Bollywood Bling and Third Time's A Charm! Eeeek! Thanks for the chance! i think Third Time's A Charm is right up my alley! Babi's Bollywood Bling since I'm a sucker for red polishes! My favorite would have to be You're Sapphired! It's SO hard to choose which is my favorite!...LOL!....It's between Life's Greatest Lesson and Riddled With Passion! I Love all of these beautiful colors but if I have to choose one it's Sapphired because I Love blue colors. Hard to pick just one but Life's Greatest Lesson is my favorite. I love them all, but I would have to say my favorite it the teal. I love Babi's Bollywood bling, it's absolutely stunning! I think Third Time's A Charm will be perfect for me <3 thank you for a chance. Riddled with Passion is my fav! Babi's Bollywood Bling and Third times a charm!!! My favorite of the six is Babi's Bollywood Bling. Thanks for the giveaway! Uh, I'm supposed to choose a favorite?!? Girl, you're crazy! That's like asking to pick your favorite child! LOL! Choosing a favorite is tough, but I think Third Time's a Charm is tied with Babi's Bollywood Bling. Yowza and Wicked for the win!!! Love the You're Sapphired!!!! It's gorgeous!! I fancy Riddled with passion! All of them!! Or Riddled with Passion maybe! I love Riddled With Passion! You're Sapphired is my favourite! Babi's Bollywood Bling and Just His Type are my favorites!